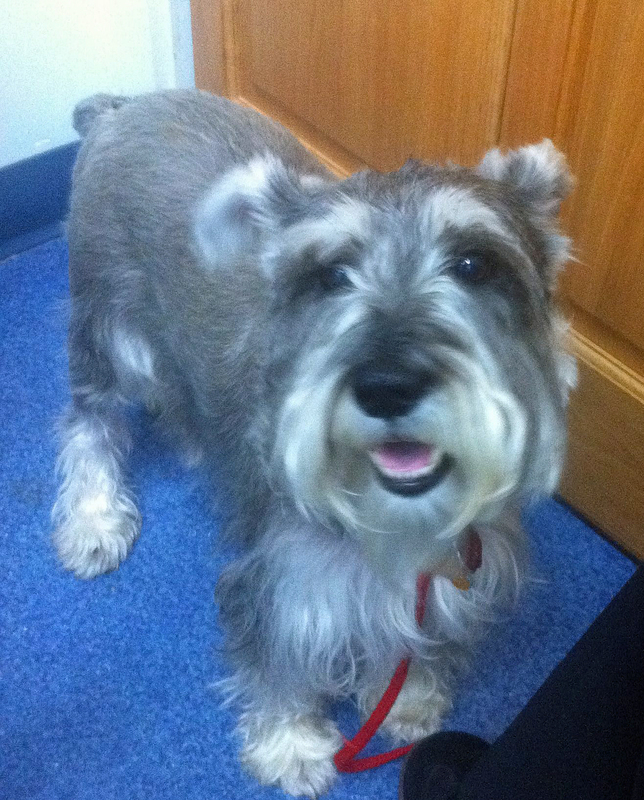 Max is a sweet, pure-bred miniature schnauzer who loves laps. We welcomed Max to the family less than 48 hours ago. 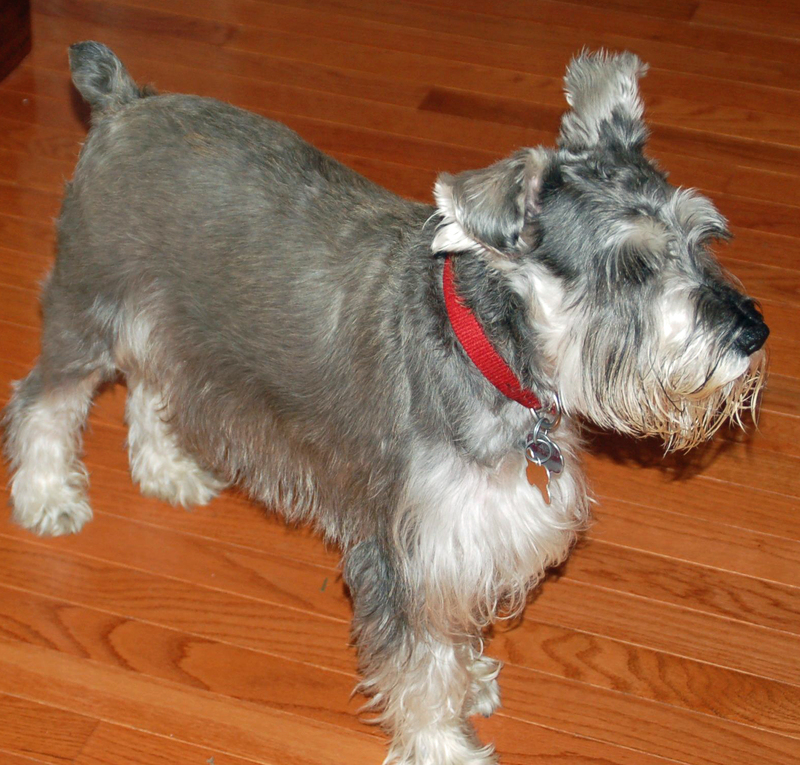 Max is a four-year-old miniature schnauzer. He is well behaved and a cuddler. He is also recently diagnosed as diabetic. Max’s elderly owners, who have chronic health problems of their own, knew it would be best for someone else to care for him. They had Max well trained, and he lived with another schnauzer, so they did a good job of giving us a well-adjusted dog. We had a sweet dachshund-terrier mix, angel dog Alex, who developed diabetes. We took care of him for five years before he could not get over pneumonia. We know how to handle insulin shots, diet, behavior, etc. Our regular vet knew this too and knew how hard it was to lose Hope. In my head I first felt it was too soon after losing Hope, but God doesn’t have to hit me over the head with a baseball bat. In my heart I knew it made sense. As for Jake and Windy, the jury is still out. Max accidently stepped on Windy, and she growled and snapped. He was frightened, so Windy is continuing on her conquest of the world. 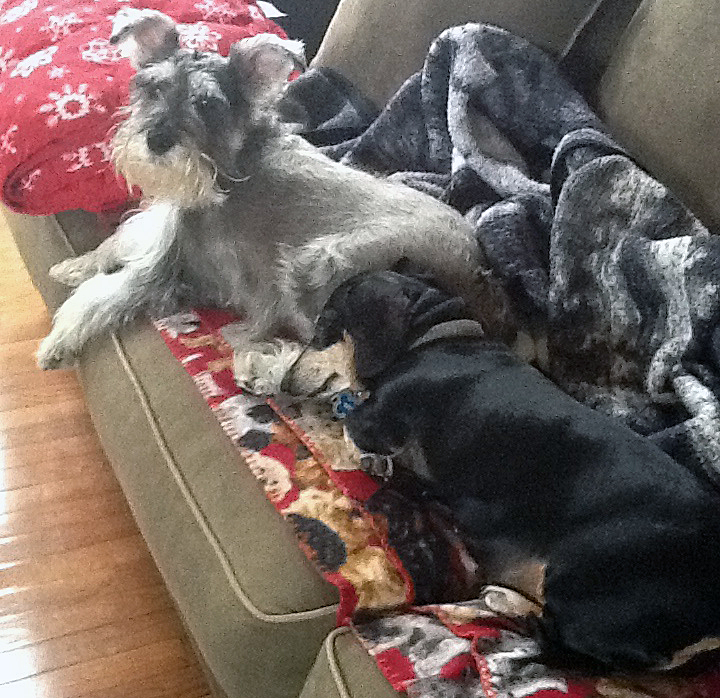 In spite of getting annoyed with him, Windy thinks Max is acceptable to share the couch. Jake, on the other hand, is watchful and noncommittal. Max is genial and wants to get along with everyone. Please be happy for us. And have a Happy New Year. Max meets us in our veterinarian's office. This entry was posted in Diabetes, Dog Food, Dog Health, Schnauzers and tagged Dachshunds, Diabetes, Dog Behavior, dog health, Schnauzers. Bookmark the permalink. Congratulations on the addition of Max to your furry family. Bless you for giving a diabetic dog a wonderful home. Hope would be so proud. What a beautiful boy…Congrantulations Kelly, Steve, Windy & Jake….your Angel Hope had a hand in this for certain. Love you guys!!! If you’re coming down to visit Barb soon, I may need to ask you a very strange favor. Email me at MySchnauzers@msn.com if you are coming down to see Barb’s pups. One day we will meet, Mendi.